In the past, mothers would feed their children as much as possible so they could live through a famine. When there was food, they ate a lot in order to store up for the winter. Times have certainly changed! We no longer have famine, yet moms still push their kids to eat. I often see overweight children in my office, with parents complaining they won’t eat anything. In one case, I decided to pursue the issue; a mom insisted that her active, healthy child had eaten “absolutely nothing” for more than two weeks. I brought another doctor in, and the first question he asked was whether the child liked McDonald’s. The mother replied that her child would only eat at McDonald’s three times per day, and if he wasn’t taken there, he wouldn’t eat at all! She was distraught that her two-year-old child wouldn’t eat what she cooked. Unfortunately, the fast food industry is too convenient; we end up sacrificing nutrition for efficiency and taste. 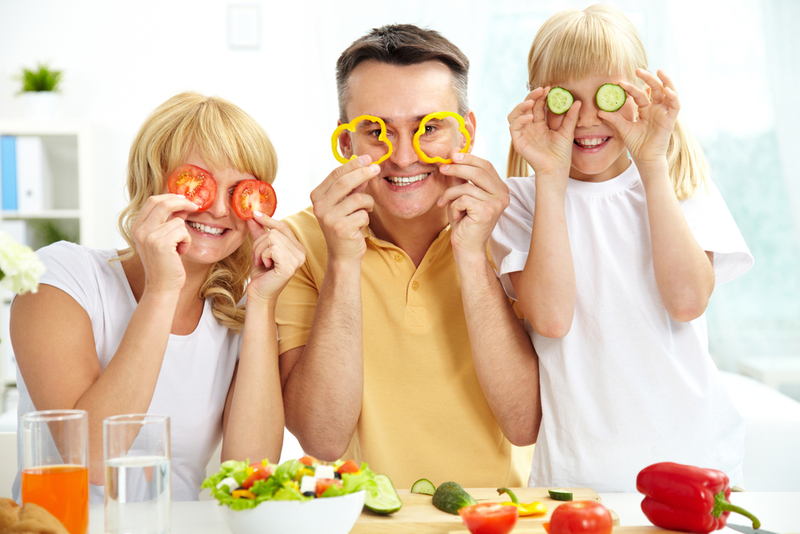 If families are looking for ideal meals, they should look for as many high-nutrient and low-calorie foods as possible. At Barton Publishing, we’ve realized that restaurants have just the opposite – high-calorie and low-nutrient meals – so cooking at home is important. One of the reasons home cooking is so much better is that restaurants and packaged foods have moved away from using spices and instead use “flavorings” made of chemicals like ketones. Spices, on the other hand, carry an abundance of nutritional value. For example, turmeric is a great antioxidant. Oregano keeps candida- and yeast-levels down. Ginger helps the adrenal glands. Black pepper promotes better absorption of nutrients from your food. Cinnamon aids in using energy more efficiently. Also, the right amount of salt is essential – don’t skimp! We have been told for years that we shouldn’t eat salt, but we need salt for our glands and cells to function properly. If time is a factor, there are still many tasty, nutritious meals that can be prepared quickly and easily. The best way to plan meals is to think ahead. If you cook brown rice, which takes longer, make enough for a week’s worth of dishes, such as stir-fry, chicken fried rice, rice salads, and side dishes. If you are already in a hurry, quinoa cooks up quickly. A complete meal needs to contain vegetables; they’re the most nutritious food with the fewest number of calories. You can be creative with this. Kale is the best food in the world because it has the highest nutrient-to-calorie ratio. It can be mixed in salads, soups (it’s great finely chopped in chicken soup), and any vegetable dish. Even snack-foods can easily be made healthier. My mom used to put wheat germ in cookies. Also, making the switch to whole foods will boost your nutritional intake: whole grain pasta, brown rice, and whole wheat bread add small amounts of nutrients that build up over time. Snacks can be a good option for children – if you’re careful and aren’t fooled by advertising. A mother could answer every “I’m hungry!” with, “You may have a fruit or vegetable anytime you want without asking.” Baby carrots, celery, and fruit make fast, tasty snacks. Be aware that anything that comes in a box or bag is going to be high in calories and low in nutrients, even if it says “low-fat.” Last week, while walking through the grocery store, I saw a peppermint candy that said in bold letters across the front, “A low-fat food.” It might be low in fat, but it’s sure to be high in sugar or calories. I’m often asked about cooking with oils. Olive oil is great for cooking, but not in the frying pan – it oxidizes in high heat. It’s better to use coconut oil for frying. Coconut oil has medium-chain triglycerides, essential for creating cell membranes and repairing the nervous system. Many moms worry about their children getting enough protein, but if you’re eating natural foods, it’s difficult not to get enough. Broccoli has more protein in it than a mother’s milk when compared ounce-for-ounce. Beans are an excellent source; when added to rice, they make a complete protein. All meats are made of protein and are easily digested, yet choosing meat is very important. You are what you eat, and so are the cows, chickens, or fish you consume. If the animals are eating junk food, then the meat will be junk-filled as well. Farmed fish that are fed cornmeal, for example, don’t have the benefits of regular fish because their oils are loaded with omega-6 from the corn, not omega-3 from plankton. Cows that are fed corn also have lower-quality fats that can cause inflammation. It would be healthier, therefore, to eat smaller amounts of grass-fed beef and wild fish, although they may be more expensive. Speaking of expense, healthier eating will be more expensive. It’s unfortunate that even when children and adults are suffering from obesity in such high numbers that healthier options have to be more expensive than junk food. In the end, you will be doing your body – and your family’s bodies – a favor by taking in good foods, rather than junk that isn’t beneficial. Also, they may eat less and be able to maintain a more healthy weight. Think of it this way: By keeping your kids healthy with good food choices, you’ll cut down on the expense of taking them to the doctor for not eating! Dr. Scott Saunders is the Health and Nutrition Advisor of Barton Publishing, a company that promotes natural health through teaching people how to cure themselves using alternative home remedies instead of expensive and harmful prescription drugs. Saunders is the director of The Integrative Medicine Center of Santa Barbara, which balances conventional medicine with alternative healing modalities to achieve optimal wellness. Fast food is the same as slow cooked food – it just costs less and gets to your table quicker. Over the decades, the words, the term, 'healthy food', has taken on a life (and meaning) all it's own. Healthy, for me, implies (and insists on) pure, whole foods, fresh and unadulterated. Rice has very few nutrients to begin with,and cooking it will destroy the nutrients outright. This is a fact of physics, chemically speaking. Fruits, nuts, seeds, water, vegetables (as in salads – broccoli and spinach salads etc), all types of sprouts, sashemi (beef and fish) are the only true sources for the vitamins, minerals, fats, and proteins we need. As for proteins in beans (or anywhere), proteins are an uber fragile molecule. A molecule whose lifespan inside a living organism is short to begin with (weeks). No protein molecule in the history of known science can withstand the temperatures needed to cook the foods we cook. A bean needs to be cooked at high heat for a long while – in order to kill the toxic enzymes (AKA proteins) that exist in many legumes. No “good protein” will survive this cooking process. Whole foods in their most natural state, including as much raw food as possible should be the foundation of ANY healthy diet. If all “fast food” was whole and raw (carrots, celery, fruit, and nuts, for example) then the term would have an entirely different connotation in our culture. However, we recognize “fast food” as meaning restaurants with drive-thru windows, none of which have healthy food. A hamburger cooked at home or at a five star restaurant made from a grass fed cow is just as void of nutrients as one prepared under the golden arches. That again is a chemical fact of physics – or physical fact of chemistry. Fast food restaurants are offering more and more salad and vegetable choices all the time. Its the extras that we oursleves put on them that add calories. So, if fast food restaurants only sell what people buy wouldn't it be smart to buy whole food choices from these places so that they offer more and better choices?